Our goal is to satisfy every customer that walks through our doors by offering superior products and excellent customer service. Our experienced staff is dedicated to help you. 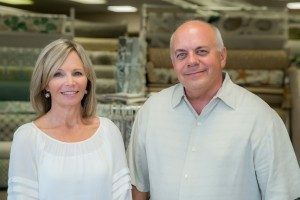 The Fabric Source has been serving northwest Florida homeowners and rental managers since 1995. In addition to stocking our showroom with bolts and bolts of first quality, decorative fabrics ready for purchase, we have literally thousands upon thousands of fabric samples available for special order. We are also a full service window covering business providing exceptional quality and value in all types of window treatments. From plantation shutters, shades and blinds to drapery and bedding, The Fabric Source can be your one stop shop for all your window covering needs. Want it motorized? We can do it. We are the experts and most importantly, we will service everything we sell. Visit our interactive showroom and we’ll help you select the perfect window treatment. Need to update that tired, old chair? We also stock the latest upholstery fabrics for all your projects. Whether you just need one yard to recover a couple of chair bottoms or whole bolt for a sofa and bar stools, stop in and see our selection. Need an upholsterer? We can recommend one. We recently added wallpaper to our product offering. We have the most current, popular sample books and can recommend an expert wallpaper installer to estimate your project. If quality, service and value are important to you, please consider allowing The Fabric Source to offer a proposal for your next window covering project.